Legends of America, working in our RV on the road. 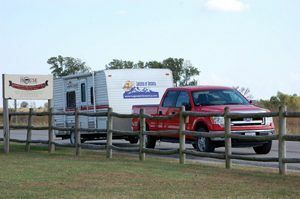 You may not realize but there are many things to consider when it comes to working out of your RV. Here are a few to keep in mind. What kind of job: Seasonal, full-time or part-time? Location: where and why? Space Consideration: How much and where? 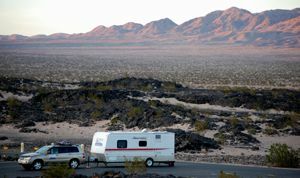 Working while RVing: Making sure you set time aside for your life and vacation. Is seasonal what your looking for? For winter you may want to consider Christmas tree farms, ski resorts, neighborhood snow shoveling. Retail stores are also looking for seasonal helpers to get them through the season. How about fall? Opportunities such as Pumpkin patches, yard clean up (due to the winds), again retail stores getting ready for the holidays. Then there is spring. Check out garden centers/nurseries who might become very busy or agricultural jobs which might just need a little extra help. Summer, if you’re not using this time to vacation here a few ideas: This is time when school is out, childcare is usually an issue with parents. You might try a daycare. Theme parks and water parks are always a refreshing way to spend the summer working. But if you are the type that likes air conditioning try fast food restaurants or even working out of your RV. Working with a computer can bring may opportunities. The computer is great for full-time and part-time work. Consider the following when searching for jobs out of your RV: Becoming a writer, having an internet web site business, sales (many opportunities), tax preparer, property care taker, a financial planner for a company that requires traveling just might be the thing your looking for. Considering space may be more important than you think. Is your RV big enough to work out of? Does your job require a lot of paper work, if so where will you put it? On the table? Are clients going to enter your RV? If so it needs to look professional. Are you going to have a considerable amount of physical inventory? These are things to consider. We suggest creating a space in the back and making it your office even if there is not desk (there are many collapsible desks available on the market). A place where a file cabinet and supplies can remain out of sight. Using your kitchen table would be a great place for a lap top and customers to have a place to sit. Having the right location is extremely important. Consider the following when choosing a location: A state that has the economical growth that fits your needs. Weather, too hot or too cold can make life miserable and costly considering the use of gas and electricity. And last but not least since you chose to work out of your RV, scenery and personal activities are something you should consider. Legends of America boon docked at Amboy Crater in 2015. Keep in mind the reason your working out of your RV is so you can enjoy life a little differently than homeowners. If you’re a workaholic make sure you set time a side for your life and for vacation. It is very tempting to work when your office is right there when you’re vacationing. This is very important so as to not burn yourself out and resent what you began as a passion. For more information about RVing visit Inside Your RV. Copyright 2006 Inside Your RV, all rights reserved. Reprinted with permission. About the Author: Rachel Weimer writes articles for Inside Your RV, a site that focuses on providing useful information on RV supplies, RV products, and accessories for RV and outdoor recreation. Offering tips and tricks on how to make your RVing life easier and more fun, is what they’re there for.